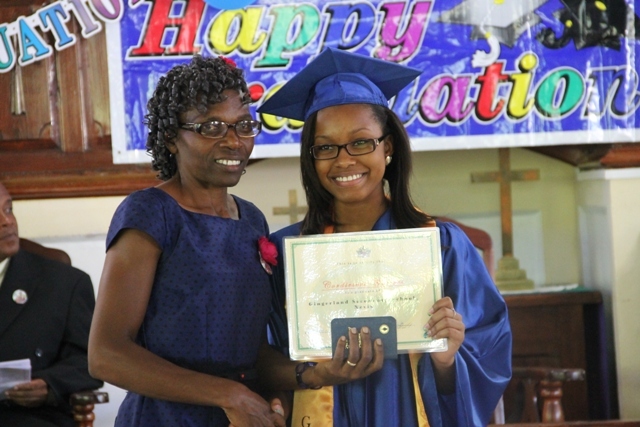 NIA CHARLESTOWN NEVIS (November 27, 2014) — You must have the courage to make a difference in the world, Valedictorian of the 2014 Graduating Class of the Gingerland Secondary School (GSS) Cordiesere Walters told her fellow 93 graduands. 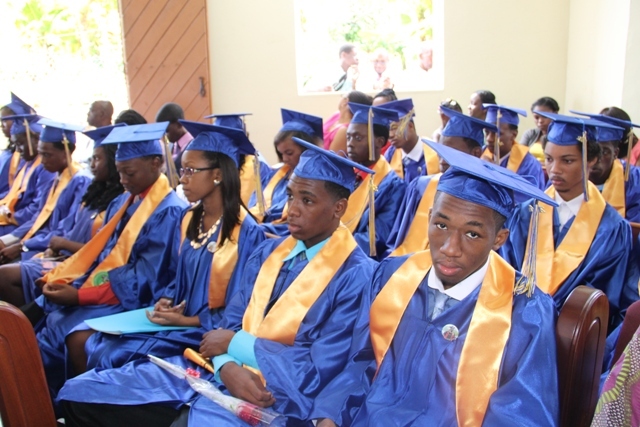 “The certificates that we will receive today are our tickets to changing the world around us. Let us graduands accept them not only as an accomplishment of our academic performance but accomplishment to well-disciplined, refined morally-guided citizens of this nation, citizens who will stand on the side of right, though the position may be unpopular. “Fellow graduands, education is not just about obtaining good grades; it encompasses the learning and practising of the values of life,” she said. Walters told her colleagues that the road ahead may seem insurmountable but they should remember that if the mountain was not rough, there would be no other way to climb it. “All that stands between you and the top of the ladder of success is just the ladder itself. I reiterate, all that stands between you and the top of the ladder of success is just the ladder itself,” she said. The Valedictorian reminded, that they had fought the good fight, finished the course and kept faith at the GSS and the time had come to continue in life. “You are our future doctors, entrepreneurs, lawyers, actors, athletes, architects, fishermen, landscapers and so much more. We have much to offer the world and yew we can make a difference in restoring our core values,” she said. However, Walters noted that although many of them were proud of their achievements, others were disheartened. She encouraged those who had not done as well to not be dispirited. “My encouragement for you is to copy the turtle. In order for the turtle to move, it has to stick its head out. There will be challenges that may beset you a little and may force you to hide in a shell. However, don’t succumb to the pressure, stick your head out and keep moving. “We will all fail at something at some point in our lives but we must never refer to ourselves as failures. Therefore, I encourage you to press on a d chase your dreams,” she said. Walters also had some words of wisdom with for students her graduating class would leave behind at the GSS. “We cannot leave without giving you some words of wisdom to guide you for the remainder of your journey at GSS. Within each one of you is a hidden store of energy to make it in this marathon called life. Within each of you is a hidden source of courage to strengthen you to face your challenges. Unlock yourself and reach for the stars,” she said. 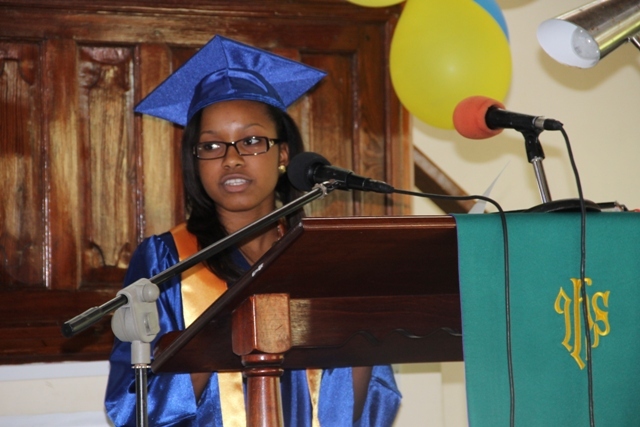 The GSS 2014 Valedictorian used the opportunity to thank God and the faculty and staff of the GSS. She also thanked the parents, who she said were the most important nurturing factor in their lives.